Stuart Weitzman is an American high-end shoe company with exclusive styles worn by the world's biggest celebrities. The unique and chic brand offers a wide collections including boots, baby shoes, and bridal shoes with designs right off the runway. With Big Apple Buddy’s personal shopping service, you can now buy direct from the Stuart Weitzman online store anytime, anywhere. Treat yourself to the Stuart Weitzman's Highland Over-the-Knee Boots! These stylish boots will cover you up while looking great in those chillier days. With six colors to choose from, you can't go wrong with whatever outfit you combine it with. The high heel gives it the extra boost and attitude that you expect from the Weitzman brand. Don't miss out on the hottest boots of the season! Are you looking for the perfect boots for the winter? 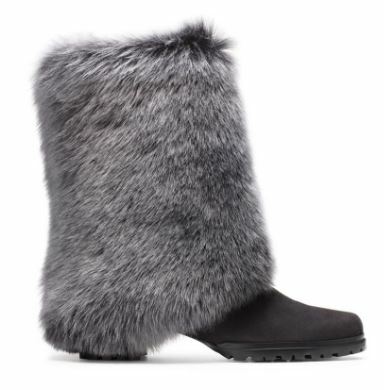 Stay cozy with the Stuart Weitzman's Blizzard Boot! The mink fur is extremely soft and comfortable so you'll never want to take them off. This unique style is one of the hottest of the season and a bold statement for your feet. Combine it with a dress or leggings for a modern and chic look that can spice up your outfit no matter the occasion. Don't miss out on Stuart Weitzman's TootToot High Heel Pumps! You get the best of both worlds with these elegant heels that are still comfortable to wear. Covered with Swarovski crystals, these rare pumps will make you stand out in the best way possible. It's a fun and modern look for the season while still preserving the classic style of Weitzman shoes and best of all, you can combine it with any bottom! Unfortunately, the USA Stuart Weitzman online store does not currently offer international shipping. However, Big Apple Buddy, your personal shopper, can help you buy products direct from the official USA Stuart Weitzman online store and ship them to your doorstep, no matter where you are in the world. We offer international shipping to over 190 countries including Australia, Austria, Bahrain, Belgium, Bosnia & Herzegovnia, Brazil, Brunei, Canada, China, Croatia, Cyprus, Denmark, Estonia, Finland, France, Germany, Hong Kong, Hungary, India, Indonesia, Ireland, Israel, Italy, Japan, Kenya, Kuwait, Lithuania, Macau, Malaysia, Maldives, Mexico, Namibia, Netherlands, New Zealand, Norway, Oman, Pakistan, Portugal, Saudi Arabia, Scotland, Serbia, Singapore, Slovenia, South Africa, South Korea, Spain, Sri Lanka, Sweden, Switzerland, Taiwan, Tanzania, Thailand, UAE, UK and Ukraine. If you would like to buy from the USA Stuart Weitzman online store, simply let us know which items you would like to order (by filling out the form on the right) and we’ll get back to you with a free international shipping quote within 24 hours!